NORTH WILKESBORO, N.C., Sept. 9, 2014 (GLOBE NEWSWIRE) — Window World®, America’s largest replacement window and home remodeling company, has announced it recently sold its 10,000,000th window. 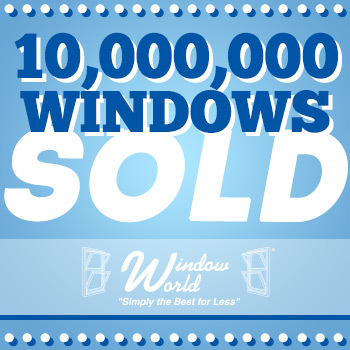 Window World has sold over 1,000,000 windows annually since 2009. Its team attributes strong sales even in weak economic times to a steadfast commitment, enterprise-wide, to fulfilling the Window World promise of providing superior products, professionally installed, at a guaranteed low price. Window World, Inc.®, headquartered in North Wilkesboro, N.C., is a replacement window company with stores and offices in more than 200 cities nationwide. Founded in 1995 and led by CEO Tammy Whitworth, the company supplies windows, siding and doors to consumers through its network of stores. Window World is an ENERGY STAR® retail partner. Its products have earned the Good Housekeeping Seal of Approval five years in a row. Additionally, through its charitable foundation Window World Cares®, the Window World family provides funding for St. Jude Children’s Research Hospital® and was named New Corporate partner of the Year in 2010. Window World, Inc. also supports the Veterans Airlift Command, a non-profit organization that facilitates free air transportation to wounded warriors, veterans and their families. For more information about Window World, visit www.WindowWorld.com or call 1-800 NEXT WINDOW. Window World of Lafayette is locally owned and operated in Lafayette, LA. The store, located at 114-A Arnould Blvd. Lafayette, LA, serves homeowners in the counties of Evangeline, Saint Landry, Jefferson Davis, Acadia, Lafayette, Saint Martin, Vermillion, and Iberia. For more information about Window World of Lafayette, visit www.windowslafayette.com or call (337) 234-6343.